CSUN students and faculty advisors show off their two awards from the 2017 "Haunt Couture" competition. Pictured L-R: Rodica Kohn, professor in the interior design option and faculty advisor for the IIDA campus chapter; Kristin King, assistant professor and coordinator for the interior design option; Nicole Esper, interior design senior; Ana Leon Martinez, interior design senior; Ali Griner, psychology senior; Shahrzad Rabat, interior design senior; Shadi Ahmadizadeh, interior design senior; and Farrell J. Webb, dean of the College of Health and Human Development. Photo by Lee Choo. CSUN psychology senior Ali Griner models design students’ creation on the runway at the IIDA Haunt Couture competition. Photo courtesy of IIDA. 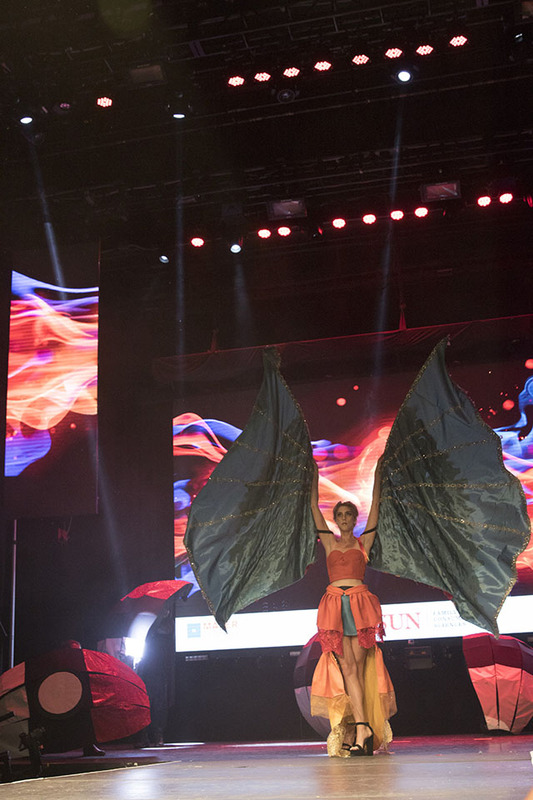 CSUN students based their design on the fire-breathing Pokémon character Charizard, an orange dragon with blue wings. Photo courtesy of IIDA. It cost a lot of sleep and time and incited a few nerves, but in the end, all the effort paid off. Six California State University, Northridge students won the International Interior Design Association (IIDA) 2017 “Haunt Couture” award in the “animation” and “people’s choice” categories. 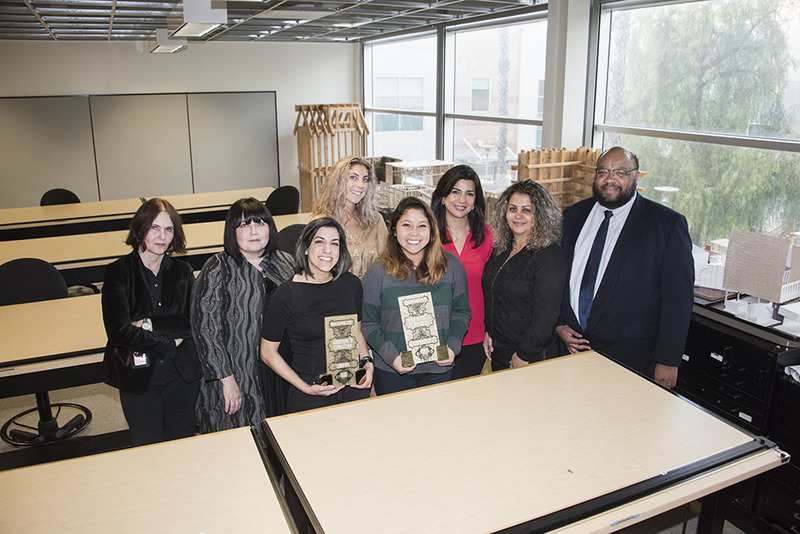 The winning CSUN team in the creative competition was made up of interior design seniors Shadi Ahmadizadeh, Nicole Esper, Ana Leon Martinez and Shahrzad Rabat, and apparel design and merchandising seniors Estefany Gallegos and Maria Juarez. The students based their design on the fire-breathing Pokémon character Charizard, an orange dragon with blue wings. “Being original was very important to us. That’s why we picked an animation topic where no costumes existed yet,” said Esper. 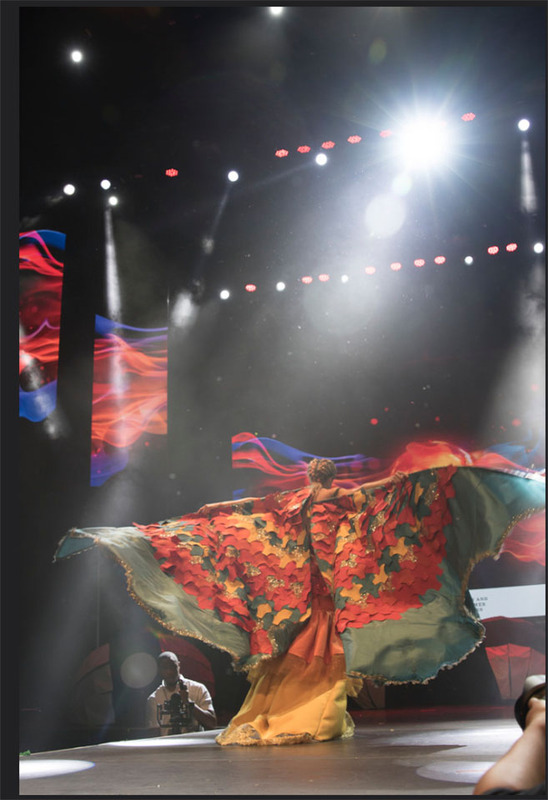 The students created a “dragon lady” costume, which included the design of a yellow-and-orange dress and big, colorful wings. The IIDA is an association for commercial interior design professionals; it runs a campus chapter for student members at CSUN. The annual Haunt Couture is a design competition hosted by the Southern California chapter of IIDA. The idea of the contest is to create outfits with materials used in interior design. Fourteen teams of professionals and student teams from three schools — CSUN, California State University, Long Beach and College of the Canyons — competed for this year’s awards with the theme, “From Hollywood to Bollywood.” During the show, every team had 90 seconds to present its work on the runway. “We were up against professionals such as architectural firms, so it was a huge deal,” said CSUN psychology senior Ali Griner, who served as the model presenting the design students’ creation on the runway. The students started their work at the beginning of the fall semester and didn’t finish until the morning of the competition, Oct. 25. “My husband cooked for us, and we didn’t sleep all night,” Ahmadizadeh added. The morning of the competition, the students were exhausted but ready to show off their creation. With the help of Paula Thomson, professor and dance coordinator in the Department of Kinesiology, they had prepared choreography to music — produced for them by musician Brian “Frawsty” Foster. “The show needed to contain some element of surprise or transformation, so we included a poké ball that breaks apart to reveal the model,” Esper said. Sponsors 2010 Los Angeles Office Furniture supported the students’ work financially, and Mayer Fabrics donated the materials. To watch video of the students’ runway presentation, visit here.